I am sick and tired of no longer feeling good when I look in the mirror. I am tired of not having enough energy to try and enjoy time with my kids. I am tired of being tired. I am not a size 2, I have never been a size 2 and I have no goals to be a size 2. I am not concerned with the number on the scale as much as I am how my clothes fit and how I feel. The thinnest I have ever been in my adult life was when I got married. My goal is to weigh around that same weight by the end of the year. 7 years ago I weighed 140 pounds. 7 years, 2 kids and a lot of unhealthy eating habits later and something has to change. And we have all made the excuses. I don’t have time to work out. The kids keep me so busy. I am just so tired. And while these are all valid reasons they do not have to hold you back. Over the next few weeks you can join me and several other bloggers as we try out and report back to you on our experiences with 20 Second Fitness. I am so excited to give this a try. The basics of 20 Second Fitness is intense movement for 20 seconds done in repetition. Total you will not spend more than 12 minutes per day working out. And who can’t spare 12 minutes? I have started the work outs today and in just 4 minutes I was done. My heart rate was up and I even broke a bit of a sweat. The program consists of 6 DVDs, set of resistance bands, jump rope, food guide and a wall calendar to track your progress. For the next two weeks I will be doing the warm up DVD. This is designed to get you back into being active to help eliminate soreness and still keep you motivated. My plan is to update at least once a week on how this is going and keep you updated on my progress. Now for the not fun part. 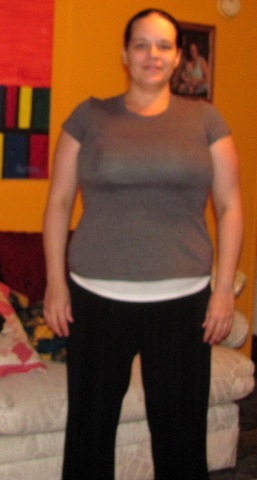 Before pictures, weight and measurements. This is the most personal thing I have ever shared on my blog. I do not own a scale so I do not have an accurate weight. However I was weighed about 6 weeks ago, so for now I will use that as my starting weight. My goal is to lose 30 pounds by Christmas. Of course I am sure that I can do this sooner but I want to give myself enough time to accomplish it. Overall I am really looking to feel better. I want more energy and I just want to feel better in my own skin. You can purchase 20 Second Fitness with their 60-day money-back guarantee and hassle free returns for only $99.99 (or 3 payments of $39.99). I have a special coupon code for you to use to get FREE SHIPPING. 20 Second Fitness coupon code: “Yellow Tennessee”. 20 second fitness: do you have 4-12 minutes a day? from Kim @ What’s That Smell? Back on Track from Paula @ Frosted Fingers. I received one 20 Second Fitness kit in exchange for my honest review. No other compensation was given. All opinions, views, and results are my own. Before starting any exercise program, check with your doctor.